Again, I am starting this letter with a big sense of pride about our Bank. Looking back to the year we just left behind, it is outstanding how well our company has performed. I am stating this by not only talking about our financial performance — but also about how much and how good we have done to provide a great service to our clients, customers and the community we belong to in general. The year 2018 was a year when we have emphasized our motto and the meaning of our bank’s name by defining it as our new slogan – People are important. The center around which we operate are the people. Starting from the inside, people are the ones who make everything, realize every process in the Bank with a focus to satisfy the need of the people, which come to the bank as clients. Human capital is the most responsible and most merited for the success we accomplish each day. Dedication, hardworking and the creation of a great corporate culture have made our team one of the best teams in delivering a satisfying service on the market. I am tremendously proud that this year we have received a report from conducted official research on the financial market where clients rated our Bank as the one with the best service quality - creating biggest customer satisfaction. Our direction towards this result will carry on in the future as well. On the other side, we continue to make excellent progress around technology, innovation, diversity and reduced bureaucracy. We’ve helped the economy consisted of business large and small — by doing what we do best - lending, investing and serving our clients. We have provided to the community by practicing our Corporate Responsibility programs. Once again, we confirmed that our Bank is one of the greatest supporters of sport and culture in the country. 2018 was another record year across many measures for our company. 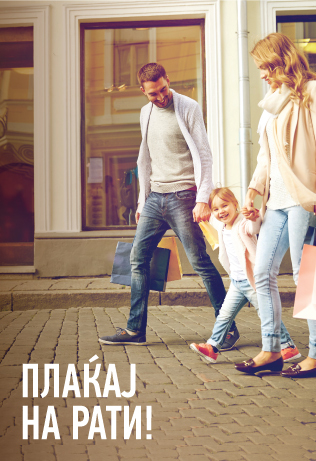 Halkbank AD Skopje continues with its organic growth and the numbers are here to affirm that. Bank’s strength and its power were elevated by added capital of 10 mil EUR, making our total capital equal to 105 mil EUR. Our branch network now includes 41 branches. In 2018, we have opened two new branches and enlarged several of the existing branches. Our personell number reached 532 employees. The alternative channels were expanded by 8 ATMs, and 570 POS terminals. The number of ATMs reached 131 and the number of POS terminals reached 6.385. The assets of the Bank increased by 11,9% (from 686,6 to 768,2 mill euros). With regard to the retail lending segment, as a bank offering credit products at the best possible rates on the home loans market, our Bank increased the amount of housing loans to 63.3million euros, achieving a net growth of 39.4%. Moreover, when it comes to the profitability, the year 2018 ended with a profit increase by 20.5%, reaching 10.6 million euros. Being delighted of all that we have delivered and accomplished at the end of the year, I will finish this letter by sharing my honest gratitude with every single member of our Halkbank family and with every one of you whom we are more than happy to serve, cooperate and work with. Wishing you a lot of health, success and joy in the year 2019!